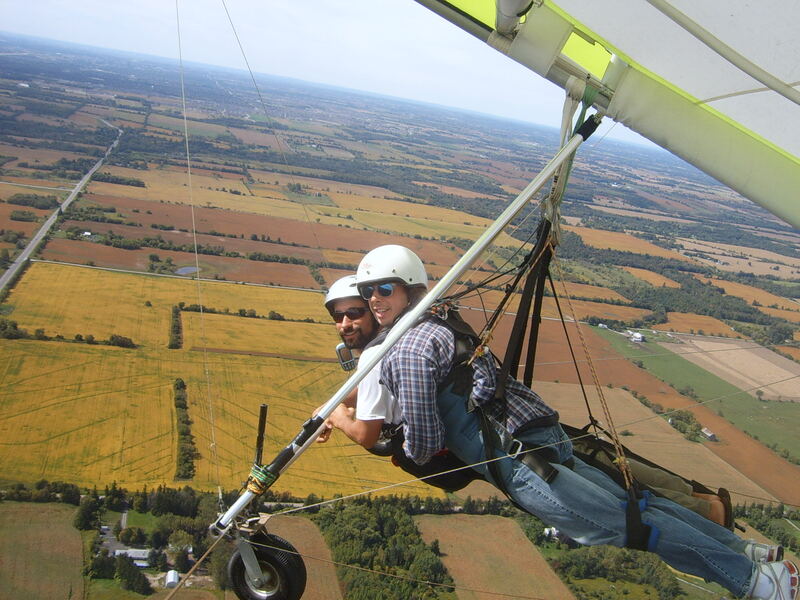 Tandem Discovery Flights allow you to experience the freedom of flight by the side of a certified professional. The feeling of freedom is fantastic. Surrounded by 30,000 empty acres, the view is breathtakingly beautiful. We can see Lake Ontario immediately and then Lake Scugog and sometimes even Lake Simcoe. It’s a dream come true…it’s awesome! The glider is launched from a flat field on wheels – no running required. You and your pilot will be towed up with a hydraulic winch to about of 1300 feet where the tow line is released and you are both free to soar about the open sky. When it is time to land your instructor will bring you both in for a gentle landing on the wheels. Free your body and soul, come fly. and they all loved it! To fly with us, please fill out the information below. Please note that this is not a secure form. If you do not want to register by this format then please call us and we can register you over the phone. Please fill out the information below. Each flight requires a $25 booking fee/deposit. Since this is not a secure form please call or e-mail your credit card #. We also accept paypal to info@flyhigh.com and interac. Please note that due to the weight restrictions of our gliders, passengers must weigh 60-240 pounds. There is no age restriction but anyone under 18 years of age must be accompanied by a parent or have written permission from both parents. Address Eg. Toronto, Brampton, Hamilton, etc. What day would you like to fly? To help alleviate weekend congestion, there is sometimes a discount for tandem discovery flights flown during the week. Please call us if you are wishing to fly within the next two days. What time of day would you prefer to fly? Morning and evening air generally offers the smoothest and calmest air which is more ideal for those afraid of heights or who may be a little nervous. Mid-day air is generally a little stronger and a little bumpy but there is a better chance of getting higher and staying up longer. Either way, we are personally going to see that you get a wonderful flight. There are several options available for your tandem flight. Please specify those that you would like. Regular flight: minimum altitude 1000 feet. Deluxe flight: minimum 2000 feet - $75 extra. Could you please take a moment to tell us how you found out about us? Have you flown with us before? To reserve your space we will need a $25 deposit per person. This is a non-refundable deposit which will be deducted from the price of your flight.